In nearly every preparedness book you look at, one of the primary staples in every stockpile is wheat. Buckets of wheat berries, flours for bread, baking, and prepared items like pasta, crackers, and packaged cookies are frequently the backbone of a prepper's stockpile. So prevalent is the dependency on wheat products that some guides recommend a whopping 300 pounds of wheat per person, per year. However, that style of pantry won't work for everyone who wishes to get prepared. There is an almost epidemic hierarchy of wheat-related ailments in America today, ranging from mild discomfort to severe debilitating illness to chronic disease. 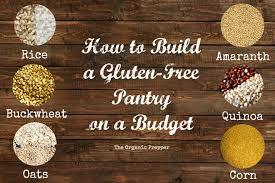 Because of this, many folks are looking for ways to build a pantry without those products. Gluten-free prepping doesn't have to be difficult or expensive. The following suggestions will help you build a pantry without wheat, even if you're on a strict budget.